←iRunFar Scape Shirts for Summer 2018! 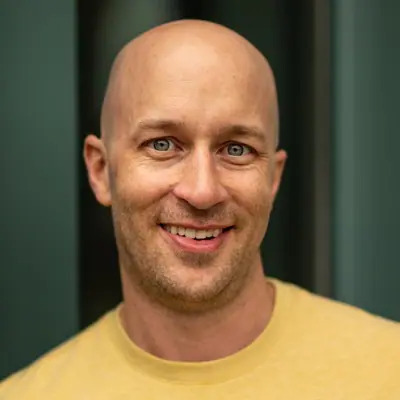 Monday was Memorial Day holiday here in the U.S., and we celebrated by, among other things, deferring ‘This Week In Running’ a day. 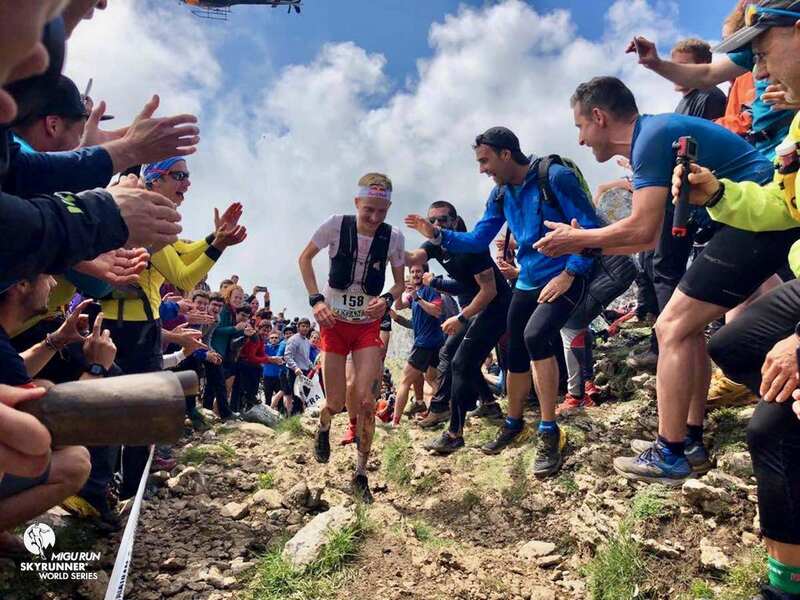 Absent a lot of stateside racing, this week’s column features highlights from the Zegama-Aizkorri Marathon in Spain, the IAU European 24-Hour Championships in Romania, and the Maxi-Race International in France. 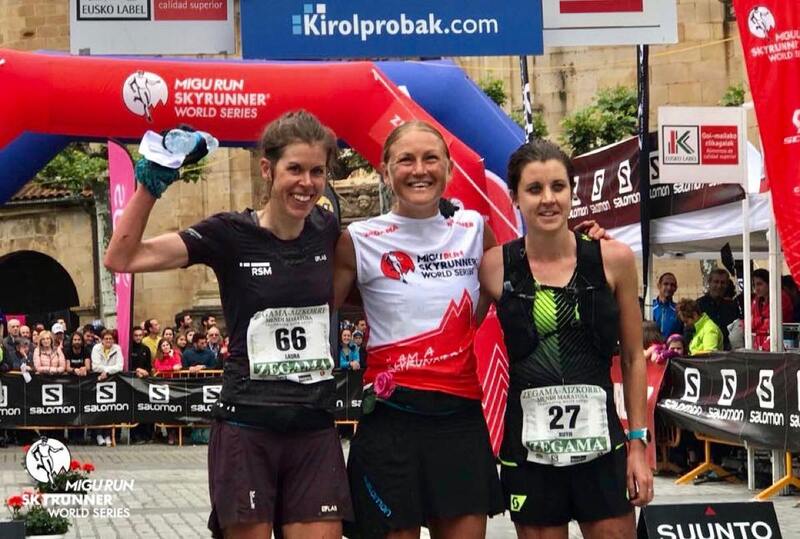 Already a classic, this year’s Zegama-Aizkorri Marathon was further heightened by inclusion in both the Skyrunner World Series and the first-year Golden Trail Series. The loop course wildly gains 2,736 meters (about 9,000 feet). Ida Nilsson (Sweden) stormed the exceptionally steep and muddy course for a dominating 4:38 win. Pre-race talk centered on how competitive this field was, but Nilsson remarkably was seven minutes better than everyone else, and she did it despite being just two weeks removed from a win at Transvulcania. Nilsson gets my nod as best in the world, right now. Second-place Laura Orgué (Spain) followed in 4:45, and Ruth Croft (New Zealand) was third in 4:48. Neither of the top-two U.S. women’s entrants, Megan Kimmel and Alicia Shay, appear to have finished. Upset city. Rémi Bonnet (Switzerland) pushed aside defending champ and course-record holder Stian Angermund (Norway) to win this year’s slugfest. Bonnet, still just 23 years old, finished in 3:53, bettering Angermund’s 3:55 by exactly 90 seconds. Perhaps an even bigger surprise, third place went to Bartłomiej Przedwojewski (Poland). Whew, that was difficult to type, let alone pronounce. Przedwojewski has an IAAF profile page with track bests comparable to a typical U.S. collegian, dating to a few years ago. Does anyone know more about this potential up and comer? Notably, the Sunday marathon-champ Bonnet also won Friday’s Vertical K race. The next Skyrunner World Series race is next weekend’s Ultra Skymarathon Madeira 56k. The next Golden Trail Series contest is the July 1 Mont-Blanc Marathon in France. Thirty countries and 181 athletes took part in the IAU European 24-Hour Championships on a 1.2k (0.76-mile) loop. World best Patrycja Bereznowska (Poland) was mightily challenged, but once again emerged victorious. 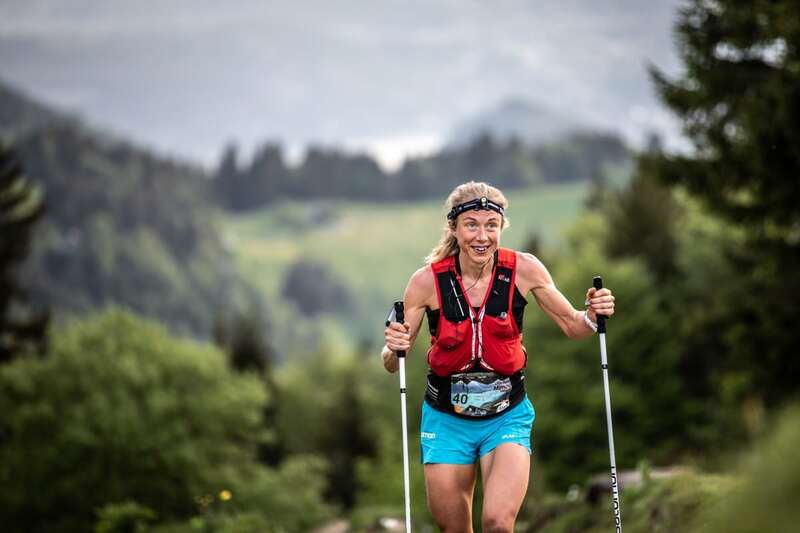 Just fifth at the 100-mile mark, Bereznowska moved to the lead after 18 hours, and then barely held off Stine Rex (Denmark). Bereznowska totaled 243.35k (151.2 miles), or about nine miles less than her own 24-hour world record. Rex valiantly followed with 241.92k (150.3 miles). Małgorzata Pazda-Pozorska and Monika Biegasiewicz, both of Poland, were third and fourth to lock in the country’s team gold medal. The men’s race was just as dramatic. Andrezj Radzikowski (Poland) took the lead in the final hour and edged Stephane Ruel (France) for individual gold. The two reached 265.41k (164.9 miles) and 263.54k (163.7 miles) milestones. Unable to hold his fast early pace, Aleksandr Sorokin (Lithuania) was third with 260.99k (162.1 miles). The 2019 IAU 24-Hour World Championships will be held May 11, 2019 in Austria. We don’t typically report on size, but these European races are big. 8,500 runners from 50 countries filled some 11 different races at France’s MaXi-Race International. The longest of the weekend’s events ran 116k (72 miles). Much like she’s done at other races, Mimmi Kotka (Sweden) pushed the entire field, eventually finishing third overall in 15:51. Men’s winner Francesco Cucco (Italy) closed his lake loop in 15:01. Dating couple Katie Schide (USA, but living in Switzerland?) and German Grangier (France) won in 11:04 and 9:31, respectively. Grangier leaped from third to the first on the race’s final descent. François D’haene (France) was just 33rd overall in 11:41, though he said ahead of the race he was planning to run the whole 85k with two friends as part of their planning for a future project. Iowa’s Booneville Backroads Ultra held five races, including three at ultra distances. The 100-mile race had just five finishers with Morgan Fowler leading the women’s race and finishing second overall in 31:23. Josh Thieman was an hour in front at 30:21. The 100k distance had no women’s finishers, and the men’s frontrunners were separated by just six seconds. Matt Timmins and Lawrence Dempsey both ran 13:48, and Timmins is listed as the victor. And in the 50k, winner Erin Bodnar dipped under the 5-hour mark at 4:59, and Doug Sturm-Smith won in 4:34. Full results. The Calgary Marathon always has a competitive 50k too. This year’s crowns went to Adriana Wild and Jacob Puzey in 3:46 and 3:04. It was Puzey’s third-straight win. Full results. 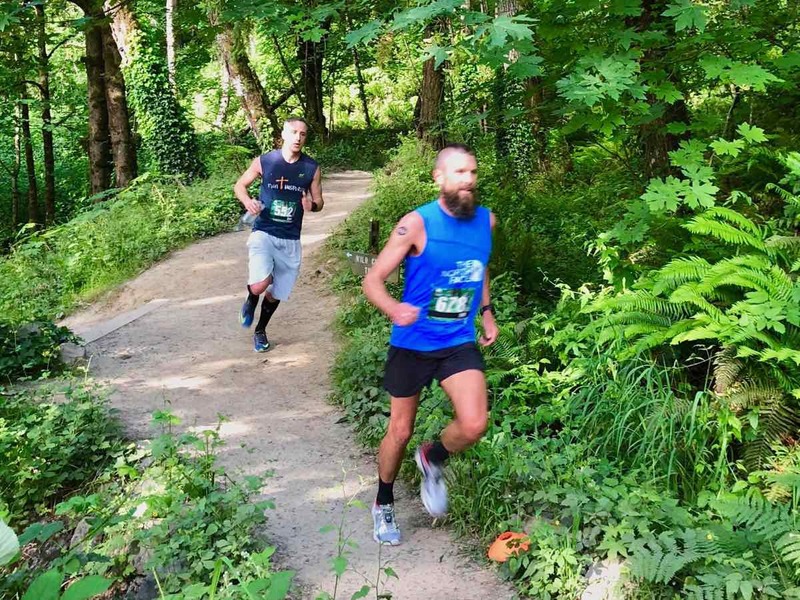 Formerly known as the Trail Factor races, these Portland, Oregon races in Forest Park are now called the Stumptown Trail Runs 50k. Former University of Oregon star Nicole Blood, a nine-time All-American, won the 50k in 4:28. Rob Krar was the men’s winner in 3:49. Full results. The Mad Moose Events High Drive Challenge in Colorado Springs runs 10 miles with an equal 1,500 foot gain and descent. Kristina Mascarenas set a new course record at the three-year-old race in 1:17. Joe Gray beat his own 2016 record with a 1:02 finish. Full results. The 50k Golden Gate Dirty 30 is a Front Range favorite. Held in Golden Gate Canyon State Park, the 10-year-old race pays out $2,000 to its winners as part of a total $8,800 prize purse. Oy, oy, oy. There is no slight to the women’s field intended, but the depth of this men’s group is outstanding. Among the women’s entrants, can anyone identify speedsters whose names we don’t recognize? Thanks! The 2018 World Mountain Running Long Distance Championships happens June 24, 2018 in Poland. The just-announced 2019 long-distance championships race will be November 26, 2019 in Argentina as part of the K42 Adventure Marathon, and the USATF mountain, ultra, trail team is already in front of it. The U.S. teams will include five men and five women. The top U.S. finisher at the 2018 championships earns an automatic team berth, and so to does the top U.S. runner at each of the November 3 Moab Trail Marathon and the June 15, 2019 Broken Arrow Sky Race 26k. Remaining team positions will be filled by the selection committee based on runner resumes. Have we ever written about Poland so much in this column? Their success wasn’t limited to the IAU European 24-hour Championships, but extended to the Zegama-Aizkorri Marathon too. FKT adventures were just announced for Harvey Lewis on the Appalachian Trail and Pete Kostelnick on a route from Kenai, Alaska to Key West, Florida. Will you follow along this summer? This week’s column was Europe heavy. Were there other U.S. results that can be added in the comments field below? Leave a note with them! Justin, Zegama is a single loop race and has a bit less than 3,000 meters of climbing (9,800 feet). While certainly technical, steep, and challenging, it doesn’t climb 5,472 meters. That would be insane. 2. Course: The event roams over the 2 sides of the Sierra of Aizkorri, it is 42.195 km in length, with an accumulated height gain of 5,472m. The measurements have been officially confirmed by technicians of the Basque Mountain Federation. But must be a translation bug. Thanks! 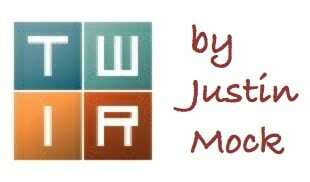 @Justin Mock – I saw the same on the website and thought, “nah really? no one could run sub 4 hours with that gain?” Makes (a little) more sense now. Accumulated in this sense means the ups and downs, i.e. 2736m uphill, and 2736 downhill. When will the US start determining national team selections from the most competitive races? As it reads currently it continues to feel like an inside job. The 26k at Broken Arrow is not even the main draw/race from Broken Arrows’s weekend of races. If the selection committee is going to allow resumes to make up the rest of the field how were Moab and Broken Arrow chosen? Certainly not based on the competitiveness of those races. Perhaps those races will now be more competitive because of this additional draw. People have plenty of time to plan now to run those. the races apply for it, I think that’s the reason. LIke USATF championship races. It has nothing to do with competition, but who puts in the bid to have the race. ….I think…. Karl, by ‘bid’ do you mean they have to pay for it (a la a UTMB pay for point scheme)? No, I don’t think they have to pay, it’s just that the USATF does not look around and find the right race, they take what they can get from RD’s who want to be a part of it. For example, I could “bid” on the Speedgoat 50k being the trial national championship, and that would be cool, but the committee at the USATF would never accept my bid because the course is too hard. A somewhat even playing field is what I’d think they are looking for. I’d love to see you bid for it Karl. What’s great about your race is that the terrain at Snowbird will prepare the lucky winners better as it’s more similar to what they will likely see at Worlds. Go for it! The Moab Marathon has been pretty competitive since it has been a National Championship race the past few years and that means something to some people. It is certainly a very tough (and beautiful!) course. What marathon-length races (the race in Argentina is 42k) would you like to see on this list instead? Just curious. Don’t get me started on trail ‘National Championships’. It clearly doesn’t mean much to the vast majority of our elites either. Why do the qualifying races need to be 42k in length? Broken Arrow is using their 26k as a qualifier. Personally, I would love to see five races used. The previous year’s world race and top American gets an auto qualifier (but can then give up their spot if they are injured or just don’t want to go the next year), plus one race in each time zone in the US to not have so much of a west coast or Colorado bias and not force east coasters to travel long distances just to find a race. My only caveat is that the terrain of the qualifying races should be sufficiently difficult (as much as possible) to help mimic what the racers will see in places like the Andes, Alps, Pyrenees, etc. Thank you for highlighting the Booneville Backroads. We set record high temps this year with an index of 104 on Saturday and 105 on Sunday. Not a single cloud in the sky all day. No shade anywhere on the course. Literally no wind either day and we got to experience some of the baddest of the badasses do some amazing things. Some were forced to make the most difficult decision in ultra running and call it quits to save their health. We couldn’t be more proud of the people that even showed up with what the weather turned out to be. We have some of the most amazing runners and volunteers in the Midwest and we welcome you all to join us next year!!!! Bartłomiej Przedwojewski is an actual polish skyrunning champion; he won it with a surprisingly big margin over Marcin Świerc last year. Before that he was very succesful in shorter mountain races, Zegama was his longest distance up to date. During reconnaissance in that area last month, he beat Marco de Gasperi by 4 min on 23km+1600 route. Definitely no surprise for us here in pl. This guy is a beast. The Dirty 30 12 miler is usually pretty competitive up front too! I’m excited to see David Roche on the start list this year, and it looks like Sandi Nypaver will be returning after her win there in 2016. Describing Remi Bonnet’s win at Zegama as ‘upset city’ is debatable. He’s an incredibly good mountain runner – just hasn’t raced a lot lately. I guess that could have kept him from being touted as a prerace favorite, but if I saw his name on an entry list, I’d bet on him. Yeeeehaw Jeff! He’s one to watch! Jared Hazen and Dave Mackey are also in the Golden Gate 50K…it’s a quality event put on by a quality person! I am very excited to see Jackson Brill and Mocko run Dirty 30!